And here is why this page is worthy of a web globalization post. Shown below is a screen grab from the Facebook page. Notice how the promo copy is in both English and French. In both blurbs, the text is asking you, the reader, to click the “like” button. The “like” button is in English, not French. So, naturally, the French text asks you to click the “J’aime” button. But the J’aime button doesn’t exist on my English-language user interface. Fortunately, Facebook does the heavy lifting for you. If you have your UI language set to French, you will see the J’aime button, as illustrated below. The Air France page remains the same but the UI language has changed. Because Facebook is well localized, Air France can create one promotional page in two languages and let Facebook take care of the UI elements. It’s an interesting strategy — though one that clearly won’t scale to support many more languages than that. But it is an approach that I could see companies using for heavily bilingual audiences. After all, it’s easier to toss out one promotional page than two. However, I’m not taking into account whether the mixing of languages makes the page more effective with its respective French- and English-speaking users. and act upon. This is what truly matters in the end. UPDATE: As Fredrik noted in his comment below, Air France only allows US residents to participate in this contest — and doesn’t let you know until after you’ve registered. 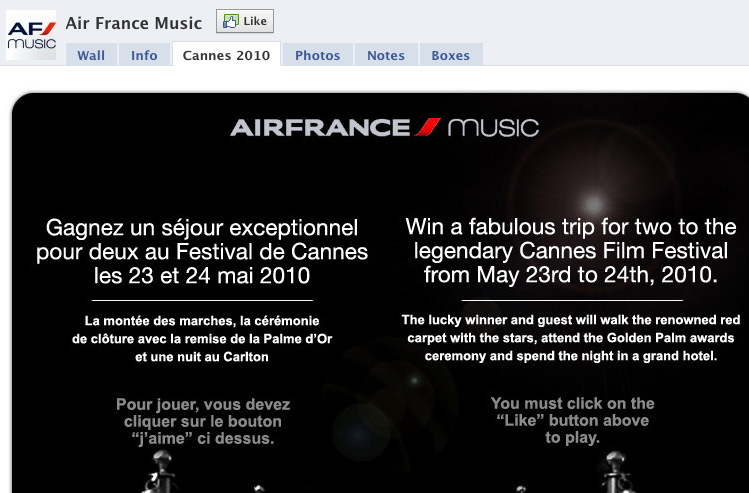 So I’d say Air France is not getting “liked” by those outside the US. In the end, however, Air France fails globalization totally: Only after you’ve taken the quiz and filled out your name and e-mail address do they inform you that this is only open to US residents.